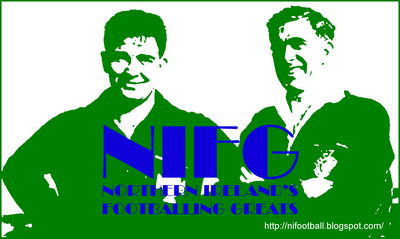 Representative Honours: Northern Ireland: 5 Full Caps (1986-1988). Club Honours: (with West Brom) Football League Division Two Play-Off Winner 1992/93 (promoted). A committed Christian and son of a Cookstown-man, Shrewsbury born Bernard McNally signed professional forms with his hometown club on his eighteenth birthday. He went on to spend nearly a decade with the Shrews, making over 300 first-team appearances. 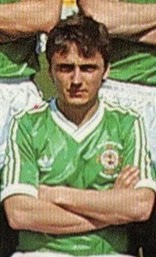 McNally was first given a chance at international level in the build up to Mexico '86, and earned himself a place in Northern Ireland's squad for the Finals despite having made just one appearance. Over the following two years he won a further four caps, and remained on the periphery of the squad as late as 1992, without ever establishing himself in Billy Bingham's plans. McNally left Shrewsbury in 1989 for West Bromwich Albion where he spent six years in which he tasted both relegation from, and promotion to, the second tier of English football. After leaving league football in 1995, McNally joined Conference side Hednesford for 18 months (playing in a 3-2 FA Cup Fourth Round defeat by eventual finalists Middlesbrough in 1997), before he finished his playing days with a month long spell as a non-contract player at Telford United. An ankle injury eventually finished his career. McNally returned to West Brom in 2002, coaching various age groups, before being appointed as Centre of Excellence Director. He left the role in July 2004 to become the first manager of AFC Telford United (following the liquidation of Telford United FC at the close of the 2003/04 season), and he led them to promotion from the Unibond League First Division in their first season. The team struggled in the Unibond Premier League and McNally was sacked mid-way through the 2004/05 campaign. From February to May 2008 McNally was manager of Indian club, Pune and in September 2009 he took charge of ex-club Hednesford, initially on a caretaker basis. He led what had been a struggling team to the promotion play-offs where they lost in the semi-finals, but left the club early in the following season in what was a "shock announcement". McNally was appointed manager at Welsh club Newtown in June 2011 and in his first season led them to the Welsh League Cup final, where they lost out on penalties to Afan Lido. The Robins struggled towards the foot of the Welsh Premier League for the following few seasons, but still it was a surprise when McNally departed for ex-club Shrewsbury in November 2013 where he took the role of head of youth. Between November 2014 and February 2015 he was manager of Port Talbot Town.